The adaptation to the screen of a most enduring stage musical is a resounding triumph. Director Tom Hooper succeeds in adding the necessary intimacy that a film demands without losing the grandeur of the production. Les Misérables on screen is a ravishingly refreshed, yet comfortably familiar, experience. 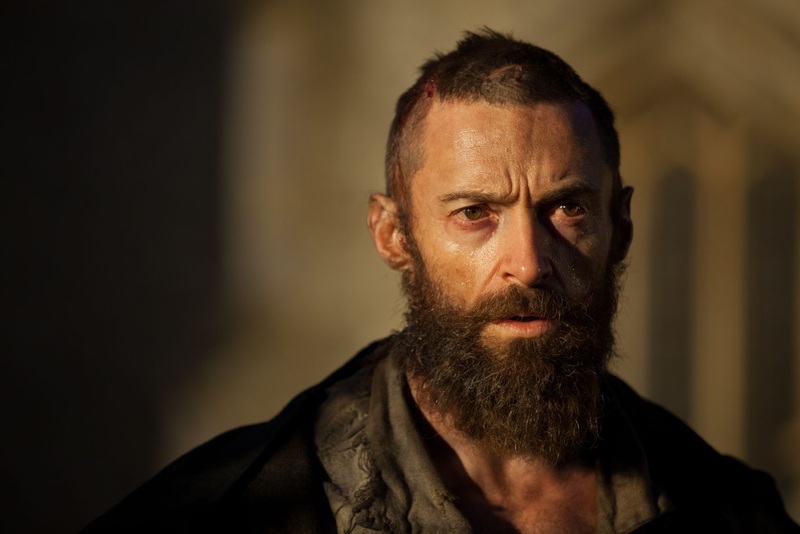 It's the early 1800s in a France wracked by widespread poverty and misery, and convict Jean Valjean (Hugh Jackman) has just finished serving 19 years of hard labour for stealing a loaf of bread. Inspector Javert (Russell Crowe) believes in the supreme rule of law, and is intent on keeping an eye on Valjean, who possesses enormous physical strength but is now on probation for life. With a record as an ex-convict, Valjean has trouble supporting himself with any means of employment. In desperation he steals silverware from a Bishop and is promptly caught. When the Bishop forgives Valjean and allows him to keep the silver, Valjean commits to changing his life for the better. Eight years layer, Valjean has become a kind and respected factory owner, employer of hundreds, and a local town mayor. 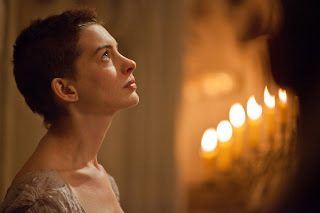 With Javert once again pursuing him for breaking probation, Valjean takes pity on Fantine (Anne Hathaway), a desperate and dying prostitute, and commits to looking after her young daughter Cosette. 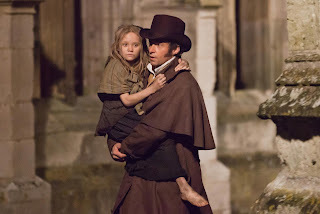 He buys Cosette's freedom from despicable innkeepers the Thénardiers (Sacha Baron Cohen and Helena Bonham Carter) and brings her up as his own daughter. Nine years later, the grown Cosette (Amanda Seyfried) falls in love with revolutionary student Marius (Eddie Redmayne), a romance facilitated by Eponine (Samantha Barks), the daughter of the Thénardiers and herself harbouring an unrequited crush on Marius. With Javert still hoping to capture Valjean, a violent but short-lived student revolt erupts on the streets of Paris, with Valjean an unwilling participant trying to save Marius' life for the sake of Cosette's future happiness. The film is a faithful adaptation of the stage musical, a generous 160 minutes on a steep emotional roller coaster. The Alain Boublil and Claude-Michel Schönberg show is based on Victor Hugo's classic novel and designed to expertly tug at the most tender of heart strings. With powerful source material, Hooper's challenge was to expand the visuals of Les Misérables without losing its impassioned strength. The inspired decision to have the actors perform the songs live while filming, rather than relying on dubbing, results in a raw, almost devastatingly emotional experience. Hugh Jackman and Anne Hathaway in particular make the most of the immediacy of the material, and deliver heartbreaking performances. Valjean's Soliloquy, after his reprieve by the Bishop, is one man questioning all he knows about life, and reorienting his future in a new direction. Hathaway's overwhelming I Dreamed A Dream is delivered in one exceptional take, a woman in close-up plundered by life and left with nothing but despair and a memory of long-lost hope. It's a career-defining highlight for Hathaway, and a rare moment when an actress radiates by tenderly baring her soul. Seyfried, Baron Cohen, Bonham Carter, and Barks deliver their songs with plenty of heart if not as much conviction, and it is Eddie Redmayne who emerges as the third powerful voice in Les Misérables, providing Marius with a romantic vitality that resonates with a struggle for a better future. Aaron Tveit as the student leader Enjolras, makes an enthusiastic impression with a small but committed role. Russell Crowe noticeably struggles with the singing in the key role of Javert, although his imposing physical presence helps to compensate. His singing does improve as the movie progresses, either as a function of improved delivery or reduced expectations. The set-design and visual style of Les Misérables recreate a Paris darkened by grime, oppression, and anguish. There is no middle-class, no in-between the rich and the poor, the oppressed and oppressors. Cinematographer Danny Cohen translates Hooper's vision into an extraordinarily dynamic environment, bringing to life the streets, the taverns, and the dingiest corners of a city wallowing in damp and aphotic misery. More so than the stage could ever do, the film is a reminder of how Hugo came up with his title. And when necessary, Cohen's cameras move in to capture the intimate gestures, expressions and details of the destitute, a reminder that misery only exists through the reflection of its victims. Despite the pervasive gloom, Les Misérables is ultimately a story of love, hope and redemption. The screen version is a celebration of the human spirit's unrelenting resolve to rise above the mire and into a better future.